We've reimagined the classic crab Louis as a satisfying sandwich, swapping in sweet, tiny bay shrimp and piling the salad onto thick slices of toasted bread. In a large bowl, combine shrimp, diced vegetables, relish, mustard, mayonnaise, and herbs. Add salt and pepper to taste. Chill at least 15 minutes to let the flavors mingle. Stir in tomatoes. 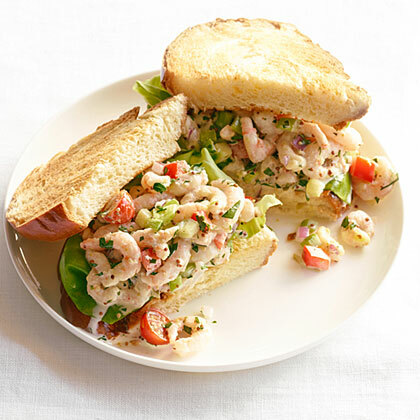 Arrange 1 lettuce leaf on 1 slice of bread and top with some shrimp mixture. Top with another slice of bread. Repeat to make 4 sandwiches. Make ahead: Shrimp filling, up to 3 hours, chilled.